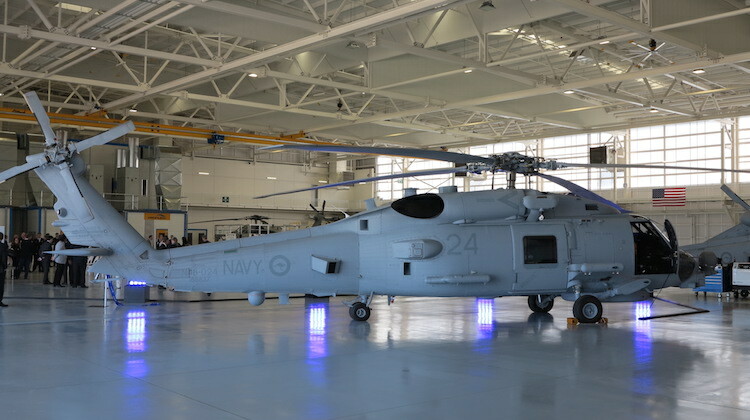 The 24th and last RAN MH-60R to be delivered, pictured in the new MHSCo facility at Nowra. The Royal Australian Navy has formally accepted the last of 24 MH-60R Seahawk ‘Romeo’ helicopters in a ceremony at Nowra on Monday. The handover came less than two years after the first Australian Romeo arrived in country and just over five years after the type was selected as the RAN’s new naval combat helicopter. The 24 helicopters have been acquired under a foreign military sales agreement with the US to replace the RAN’s existing S-70B-2 Seahawks, plus the capability never delivered by the cancelled SH-2G(A) Seasprite program, under AIR 9000 Phase 8. “We are delighted to be here today with our US Navy partners to hand over the keys to the final MH-60R Seahawk to the Royal Australian Navy,” Lockheed Martin Australia chief executive Raydon Gates said in a statement. The ceremony also marked the formal opening of the $50 million, 11,400sq m Maritime Helicopter Support Company (MHSCo) facility at Nowra, built by Lockheed Martin and its now wholly-owned subsidiary Sikorsky to provide maintenance and through life support services for the Romeo. TT, why do we need another 24?? Don’t understand why the Army went ahead with the Mhr90’s instead of sticking with the latest Blackhawks, would of saved a lot of headaches with dealing with multiple agencies. Does anybody know what is happening with the older sea hawks? a better option to the mrh-90 is the merlin! The old S70B’s would make ideal fleet utility machines stripped out and overhauled. Cheap and good fora another 15-20 years. Dave N, sold to another foreign country with approval from the US, traget practice. Hayden, have you seen the size of a Merlin compared to a MHR-90, not to mention we would need larger landing deck on our ships and hanger space. Merlins are considered heavy lift helis. The British use them side by side with the chinook. They can carry almost as much as a chinook. Fabiam the Merlin like the NH-90 family comes in both the tpt and ASW versions. Robert what would the Navy need the Super Stallon for.